I know, as corny as you get but couldn't resist it. Yesterday got a bit windy, as the forecasters predicted, and it caused chaos. Trains were cancelled in advance, speed limits set, and many, many trees decided to lay down on the tracks. Plastic sheeting around the country took a holiday on overhead lines, and a garden shed was deposited on the tracks. Locally the Orwell Bridge was closed early morning, which resulted in Ipswich being gridlocked all day. Yes I know Ipswich is always gridlocked all day but this was worse than normal! Sanders, Coach Services and Konect were withdrawing double deckers from service, and Konect deemed the Acle Straight too dangerous for buses and diverted the 7 via Filby. 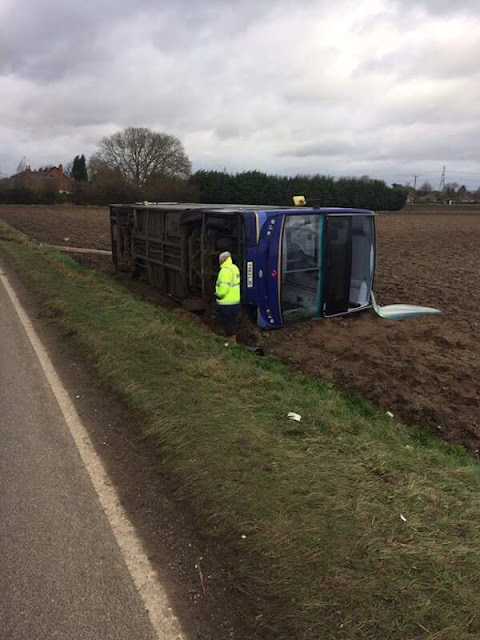 However only one major incident was reported, that being an X1 travelling between Peterborough and Wisbech, which as caught by a particularly strong gust of wind and ended up on its side in a field. Thankfully there were no serious injuries and the driver was unhurt. The vehicle involved was 33808 YX63 LJO. Being an E400 there are rumours that the damage caused has improved its looks and increased its value by around £25,000. This is one of the pictures tweeted by the police, but for many more photos and detailed report head over to the X1 Blog by clicking here. Adversity brings the best out of people, and while I was sheltering in my hovel monitoring the chaos it was heartwarming to see operators accepting everyone else's tickets on competing routes to ensure everyone got home. However it wasn't just competitors co-operating together. 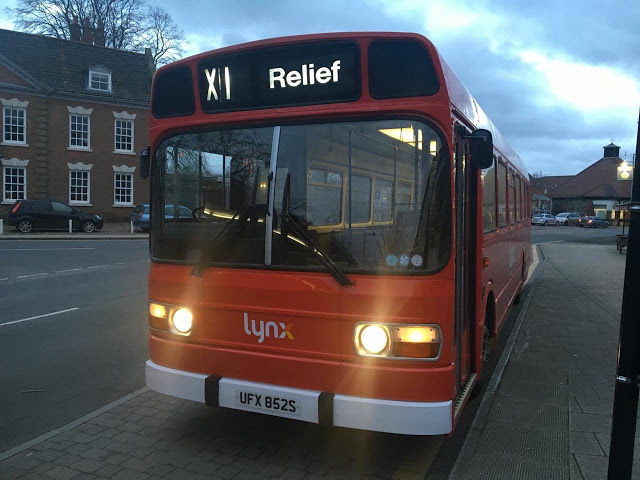 I also saw on Gerard's X1 blog a photo of Julian Patterson's Leyland National, looking great in its new Lynx livery (formerly Konect) operating a journey on the X1 from Kings Lynn to Swaffham. Absolutely superb and I would have got pretty excited had I been one of the lucky passengers. Julian has kindly agreed to let me publish the photo here, and I'm also grateful to Sam for being the messenger. 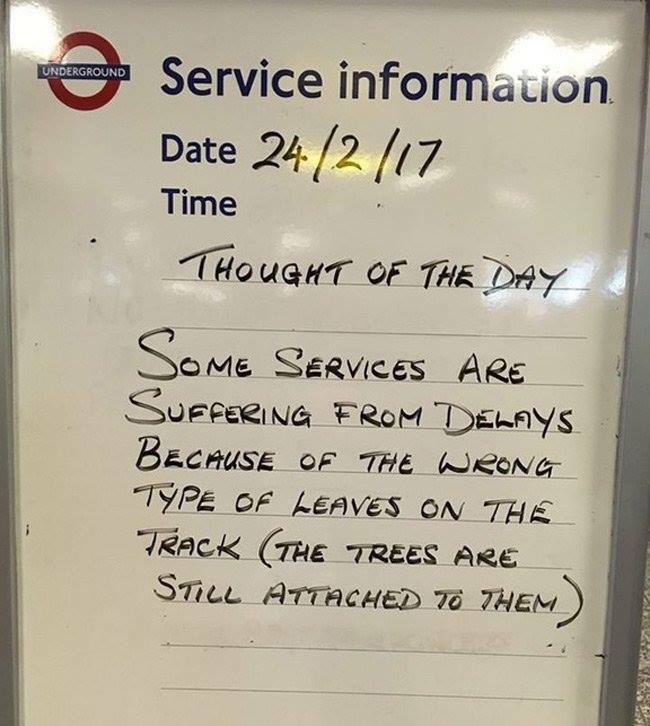 Something that makes us Brits pretty unique is our use of humour to relieve stress. This was demonstrated at an unknown Underground Station today with this inventive notice which I hope brought a smile to the suffering travellers. The Class 37 short set was employed on the main line yesterday between Norwich and Colchester after power supply probs at Diss, which again must have been, and indeed sounded good. As I type everything is just about back to normal so well done to all those who had to deal with exceptional circumstances yesterday, keeping the public informed and moving, and repairing and clearing infrastructure. Let's hope that's it for the Winter storms and we can look forward to Spring. Spring is on the way so it must be time for Anglian Bus to announce more cuts. Not officially announced yet but after a not so top secret meeting between management and staff last night I can reveal the following will be happening over the next few weeks. Fleet to be cut from 27 to 18. There have been cuts before but this is the first time there have been redundancies. It is now surely only a matter of tie before everything moves to Konect and the Anglian name becomes history. Less than 4 years ago Anglian had a fleet of 105 buses. When the latest cuts take effect Anglian will be smaller than Borderbus. Who would have believed that. More information as and when I get it. Many thanks to my sources for getting the news to me so quickly. I can also reveal the not so interesting news that this year is going to be rather quiet as far as First are concerned. This is because all effort has been focused on the expansion of Roundtree Way depot in Norwich. Soon all but the Blue Line will be based there, transferring from the Vulcan Rd site. Today I caught up with First's Director of Operations, Chris Speed, who has headed up the project, for a guided tour. 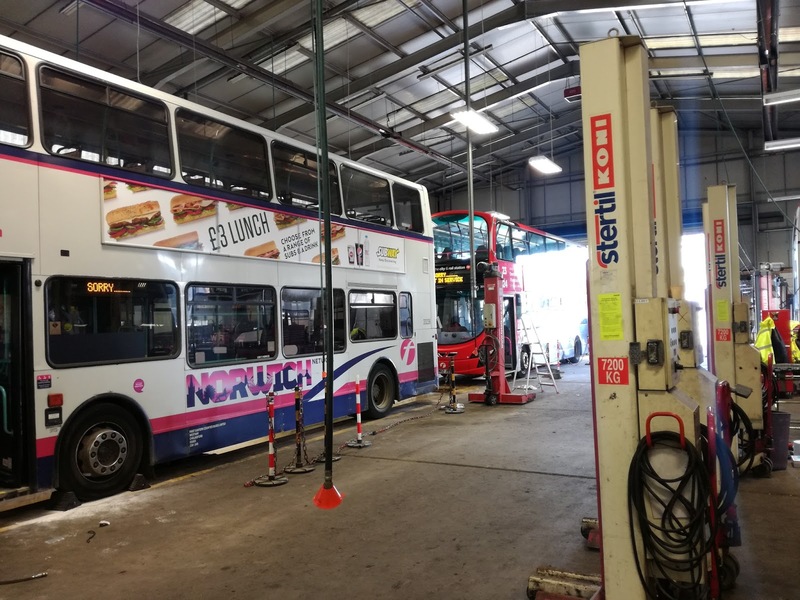 £2.2m has been spent on the expansion, which includes strengthening and upgrading the engineering department so deckers can be lifted up, a new £56,000 bus wash that can wash not only the sides of buses but front, back and roof too, two new fuel pumps, a whole new training suite upstairs in accommodation that was previously just lying derelict, new crew accommodation including toilets, showers, rest room, drivers paying in room, supervisors office and tonnes and tonnes of new cement for the parking of up to 95 buses. It is a quite enormous place now, although it would seem quite how all the buses are going to be parked still has to be worked out. 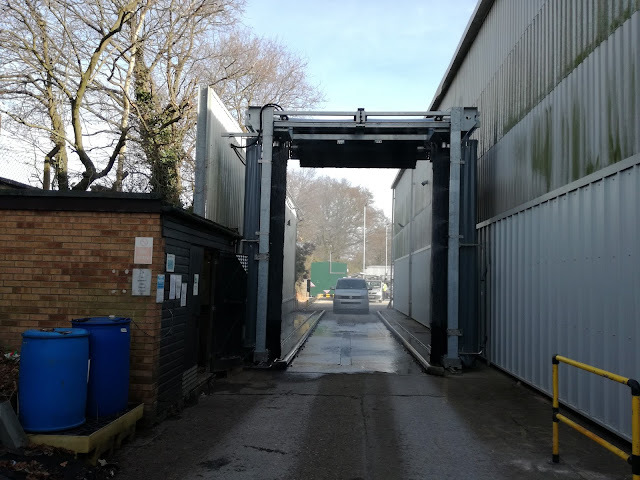 There are bound to be teething troubles but Plumstead garage in South East London might be a good model to follow - whenever I have passed there the parking has been almost a work of art. Any excuse t get a Red Line Gemini in! 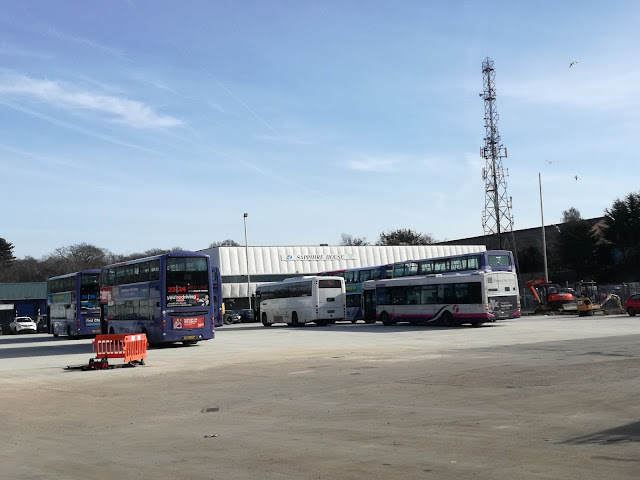 For those of you interested in the Ipswich P&R which First take over in July there is still nothing to report on what vehicles would be used. Chris's preferred option is for 2 or 3yo Volvos, but it all depends what is available at the time within the group. Once again more as and when I know it. My thanks to Chris for the tour, good to see Zak slaving away there too. I hope there is a smooth transtition and I look forward to the official launch event when it happens. It certainly shows First Group's commitment to Norwich despite persistent rumours First want to pull out of East Anglia. 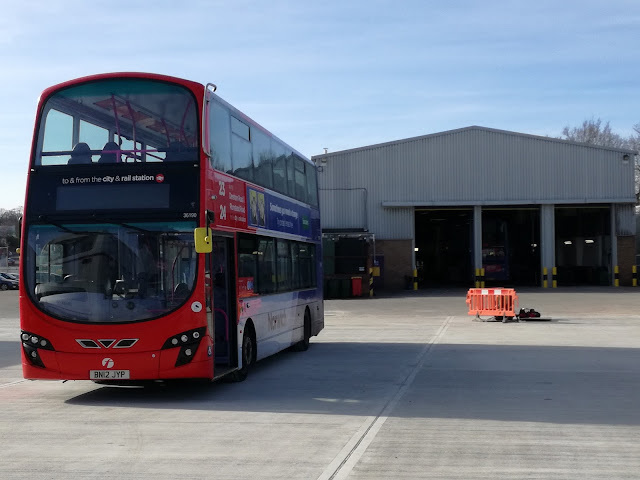 On that subject with the incessant rumours about Kings Lynn depot closing persisting Chris informed me that a further 2 year lease has been signed for the depot, so it ain't going anywhere yet! Before you read this post if you are not aware of the details of the ongoing dispute at Southern Trains over the role of the Conductor please click here and read my earlier post on this topic. Today's post was meant to be a review of the Thameslink Class 700, and a nice hour at St Albans. However, as I travelled down to my hospital appointment in East Grinstead I noticed who I assumed was the Conductor not doing much at stations, so I decided to be nosy. There followed a half hour chat that left me searching how I was going to describe what's happening at Southern in a calm, rational manner. When the 375's were introduced at Southeastern, and the identical but differently classed 377's at Southern the role of the Conductor was safe It was taken that operation of the doors would be the same as the Networker - ie the drivers released the doors and the Conductor closed them, the difference being that with the Electrostars the Conductor could close the doors from anywhere in the train, but ironically not the rear cab as they had to on the Networkers. This was soon changed as the union reasonably pointed out that the Conductor needed a safe bolthole where he could still perform his door duties if needed. It was no problem the drivers releasing the doors as they were in the best place to know if the train had stopped in the correct place. The only units the Conductor released the doors were the God awful Class 508 corned beef tins, and if you were halfway through a complex ticket in the front coach, then had to dash to the rear cab to release the doors it could cause delays and frantic pressing of buttons by passengers thinking they were going to be trapped! But on the Electrostars the role of the Conductor was preserved. Yes it took a short strike to protect our role but protected it was, and on Southeastern remains so. Not so on Southern. I watched the "Conductor" put his key in the door control panel, wait for the doors to be released, open his door, walk out and look up and down the platform, get back in, take his key out and sit down. The doors then closed and the train moved off without him doing a thing. It turns out that on the East Grinstead line the drivers have been closing the doors for 6 weeks now, longer on some other lines. In fact on all 377 operated routes the driver closes the doors. The Conductor is no more. The On Board Supervisor has been brought in regardless of union and public opinion. The sole reason the OBS had to observe the platform was in case a wheelcchair needed assistance. What a waste of a man who was guarding when the slamdoor EPB's were still running some 30 years ago. He told me the role had been downgraded so much he was sent on routes he had no knowledge of, something a Conductor would never do as they need to have extensive knowledge of the routes they work. He was meant to do commercial duties but since he hadn't been trained up on the new ticket machines he couldn't do that. It was likely the last journey on his duty would have no staff but the driver as the duty was too long and hadn't been agreed by the local union committee, whose sole job is to scrutinise duties to make sure they are legal. The trouble is the impasse between Southern and the unions remains, despite the OBS being implemented regardless of union and indeed public opinion. The operator no longer recognises the union apparently, the union doesn't recognise the role of the OBS yet their members are forced to undertake the role. I asked about the ASLEF vote, which should be complete at the end of this week. the OBS's view, as I assume I must refer to him as now, was that outside London, where DOO is prevalent, it would be rejected point blank. but the fact that drivers have accepted and are prepared to work trains effectively with no second competent member of staff on board means the union's ground is now very unsteady. They can hardly now refuse to operate trains with no Conductor when they are already doing so. No wonder ASLEF and RMT aren't the best of friends right now. Of course this is Go-Via, part of the Go Ahead group, and a lot of people in East Anglia will be well aware of their tactic of stampeding new policies in riding roughshod over unions and public opinion, then wondering why things aren't working out well. The overall emotions I detected from this chap were a mixture of bitterness and resignation. We spoke about how we had both saved lives on trains, and other duties that will no longer be performed or required. The fact is if Southern are already running trains DOO, which if there is no OBS on board they will be then how long before retiring or leaving OBS's are not replaced? Eventually Southern will get their wish and all trains will be DOO and my God they'll lose a lot in revenue. And the ultimate perversion? If you board a 12 car 377 from East Grinstead at Oxted chances are it will be driver only, or at most a chap looking out to see if there's a wheelchair. If you board a 2 car 171 from Uckfield at Oxted it will have a fully qualified Conductor on board. Makes perfect sense. I'll have the ironically driver only Class 700 review later this week. Or February in March if you like. Either way it's jolly cold! As predicted in the last post on Saturday Tim and I drove to the Cambridgeshire Fens to watch the East Coast Mainline diverts. We intended to use March as a base but also go to a couple of quieter places as we both have an aversion to too many cameras in one place. It was my first time driving across the Fens and it was rather fun - lots of Acle Straights minus the traffic! Our first port of call was a level crossing just down the line from Manea Station, of which more later. This is a crossing with a 7ft underpass for cars and a manual crossing for larger vehicles. The crossing keeper reckoned there were over 150 trains on his shift so he wouldn't have needed the gym that night! There was also a much unexpected sign at the crossing. No idea how it got there but it made for a good Twitter "Where Am I" quiz! 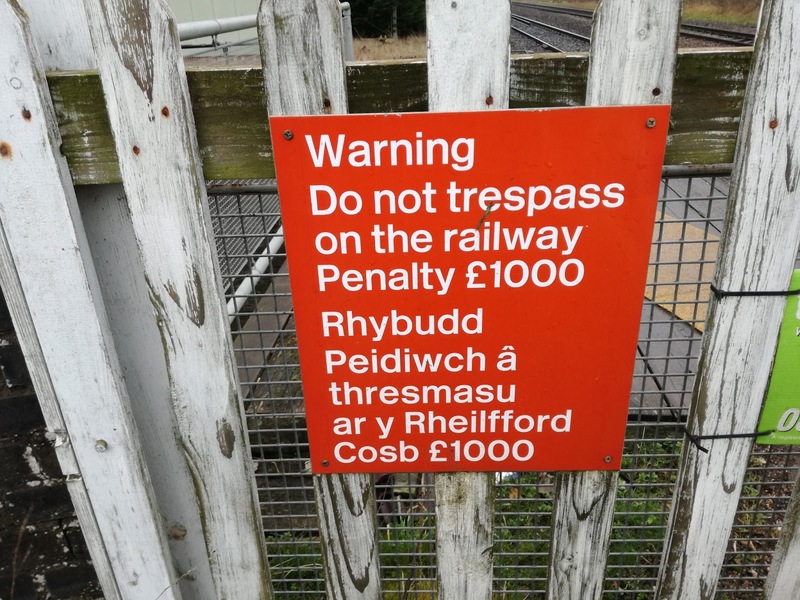 Just in case of Welsh tourists obviously! We saw a couple of trains there then drove into March for personal needs - that cold gets to you! A bit busy for us but timed it perfectly to get a Virgin HST and Hull Trains Adelante passing each other, as well as the HST set using East Midlands Trains power cars. But we wanted somewhere quieter so headed off to Manea Station, which is where the last in this first set of vids was taken. 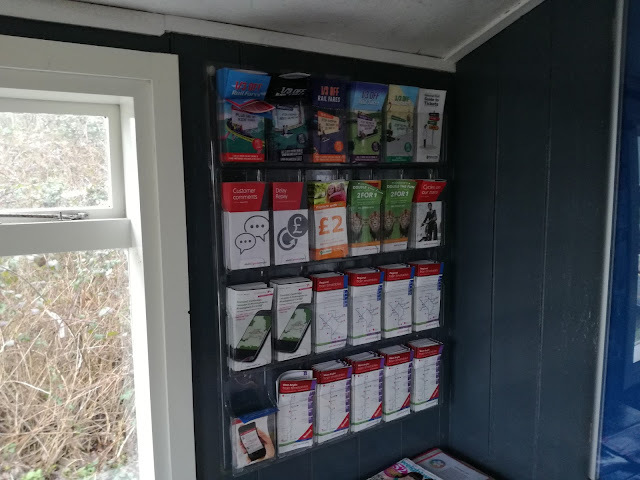 Manea is a lovely little station only served by the Greater Anglia Ipswich - Peterborough service. Two car length platforms which are rather exposed to the elements, and there were certainly elements when we were there! 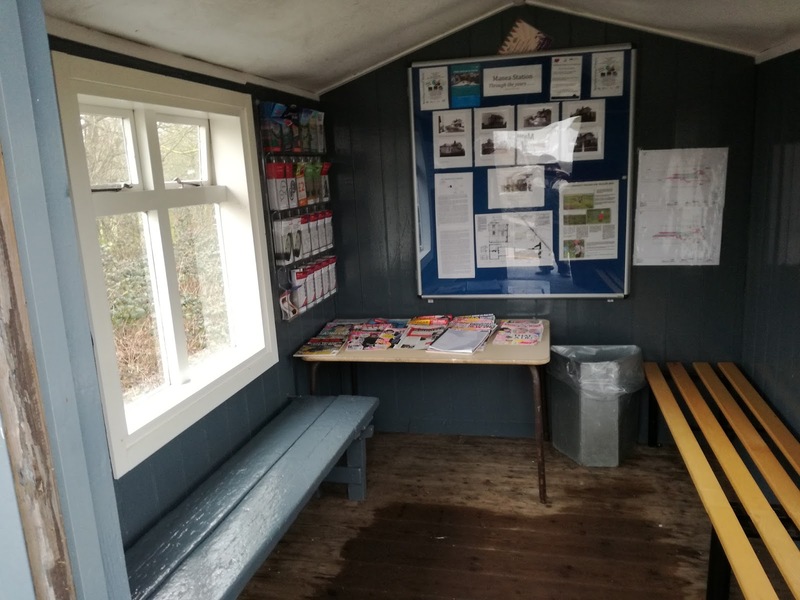 However the station iis maintained by the Manea community and there is quite the quaintest waiting room I think I've ever seen. 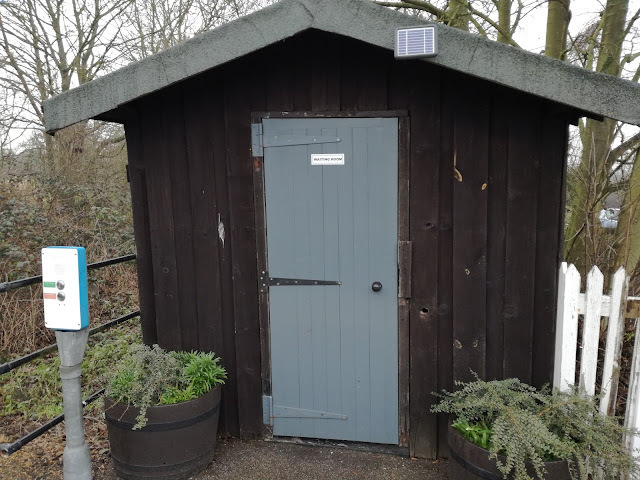 It looks like a shed. The information available is incredible. Up to date magazines are on the table, including RAIL magazine. the one thing missing though was a heater - something to think about maybe as had there been heating we'd have stayed there all day! But hats off to the Manea community. We are really hoping there are more diverts when it gets warmer as we will be back! But back to the trains and Manea was the perfect spot for watching the diverts. Now some of you will know I'm not a fully paid up member of the Class 66 fan club. However just occasionally one turns up that even I think is ok. Multicoloured 66718 passed by as a treat, and I thought would be followed almost immediately by a Grand Central Adelante going the other way. however the Adelante approached and passed at snail's pace for some reason so feel free to fast forward! Despite the cold it was a really good day. Thanks to Tim for his company, and now I'm really going for it and travelling by Southern Trains tomorrow! Report if I ever get back! Man is it dead out there. Nothing to report, nothing on VOSA, no new buses, no new trains, no new anything. Nothing, zilch, zip, zero, diddly squat! It's so dead at the moment yesterday I went to see an operator begging for something newsworthy. After a bit of head scratching the MD said "well we had a bus MOT'd this morning...." That was it! So I hope you'll understand why there hasn't been a flood of posts recently. Even the predicted snow is going to be a non event. So with nothing local to report here are a few things you may be interested in. Steady yourselves for the shock but Cambridge have some new buses on the Park & Sit In Traffic service. I have never worked out why P&R buses have to be painted in the most gaudy liveries. Yellows, pinks, oranges, greens of course, purples - and all for what? Anyway Stagecoach East have continued the trend by painting their new P&R E400MMC's in orange - assuming that car drivers can't spot their bus as easily as regular passengers I guess. I am grateful to John Taylor for sending me a couple of pics he took of the new buses. Many thanks, John. I also believe that there are new E200MMC's for Chelmsford P&R. Can't wait to see what new buses First get for Ipswich P&R! No stop laughing I'm serious! With all the talk of the possibility of one or two light snow flurries, which will inevitably see everything grind to a halt as usual, I thought I'd share some real snow with you. A couple of days ago Railcam started streaming a camera located in Finse, a small Norwegian town on the Oslo - Bergen rail line. Now these guys have serious snow and guess what - the trains not only run but on time! It is a stunning camera and worth a watch. If you go via the Railcam site the departure times are listed If you're not a member of railcam you can view the camera by clicking here, but it will be pot luck if you see a train! 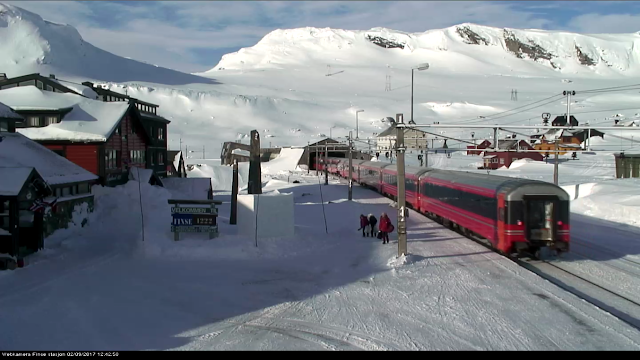 Here is the 1134 to Bergen this morning, which was 8 mins late, but imagine how late it would have been here! 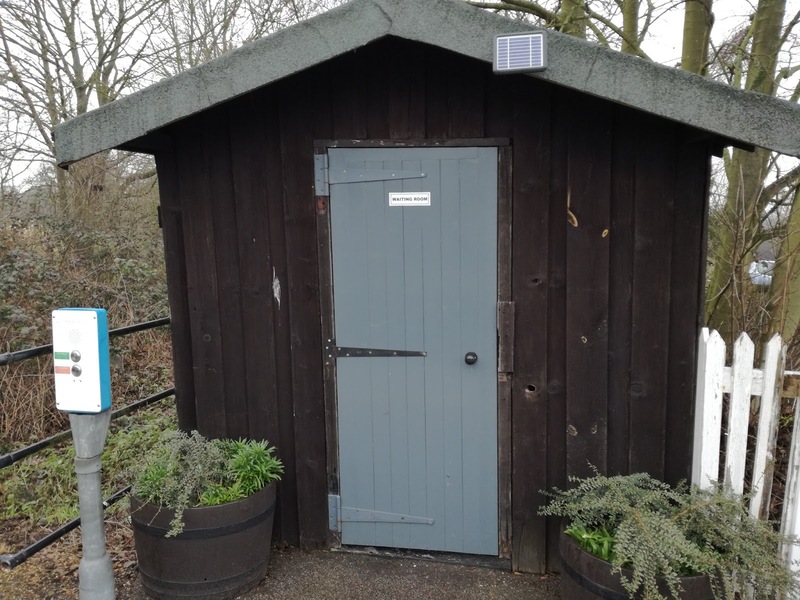 Incidentally the shed the train is heading into is exactly that - a shed built over the points so they don't get clogged with snow - there is one at the other end of the station too. Ingenious yet simple. I did a bit of research into fares on that line, which takes over 7 hours from one end to the other. A standard single is around £89, but I checked a month from now, when apparently the snow is far greater, and I found singles at £23 and £30. For a 7 hour journey that's not bad at all and worth serious consideration. 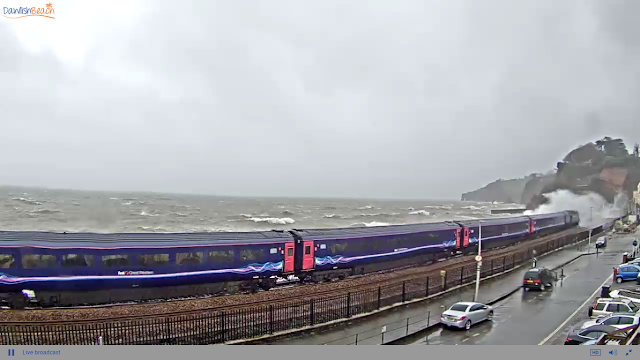 Many thanks, Railcam for sharing this quite magnificent location. 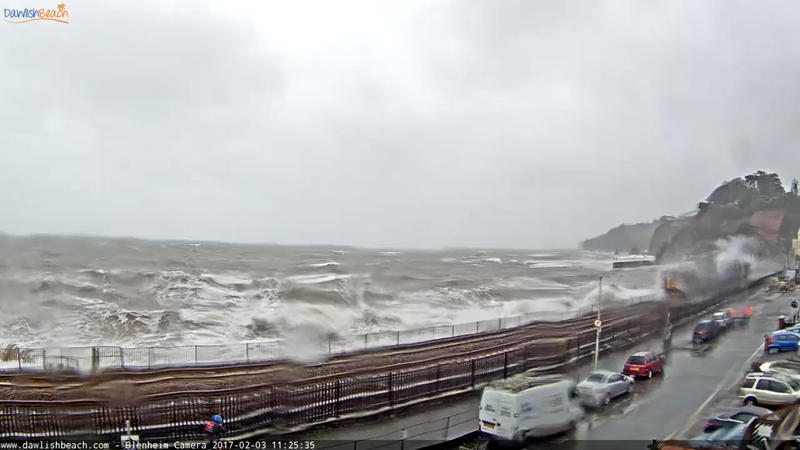 Coming home again and due to some strong winds last week Dawlish put on one heck of a show. I think it's the roughest I've ever seen it and I got some cracking stills. Here is a selection, with the usual thanks to Simon and the team for allowing me to reproduce them here. A Pacer gets a pasting - could be a Turner! 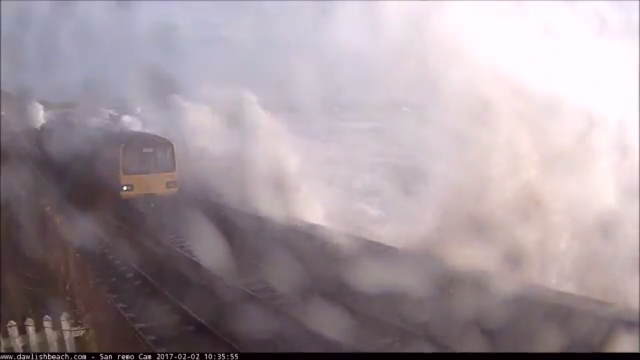 Lord only knows what it's like being on a train in those conditions but by heck I want to find out! On Saturday Tim and I are going to freeze our extremities off by going to observe the East Coast Main Line diverts between Ely and March so look out for a post Sunday on that, and Monday I have my eye check up at East Grinstead, and I'm thinking of training it this time as I want to get on one of Thameslink's new Class 700's among other things so again there will be a post on that if it happens. In the meantime to all you bus enthusiasts my apologies but apart from a bus being MOT'd there's nothing happening! Oh - if anyone knows the fuel consumption of a Volvo B9tl 2 axle let me know please! Thanks.